Corporate Debt Restructuring System was implemented in India in August, 2001. Subsequently, the guidelines were revised in December, 2005 (S. Gopinath Committee). The main features of the mechanism are given below. The objective is to ensure timely and transparent procedures for the reconstruction of sustainable companies (industrial and other) technical loans faced by the problem of DTR, BIFR and all other problems beyond the other related activities. 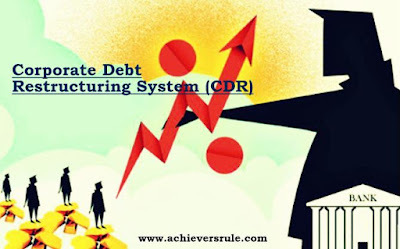 CDR system has a 3 tier structure i.e. CDR Standing Forum and its Core Group, CDR Empowered Group and CDR Cell. The Group approves the restructuring package within a specified time frame of 90 days (or at best within 180 days of reference to the group). Lead institution or major stakeholder shall work out a preliminary restructuring plan and submit to the CDR Cell within one month. Within 30 days for decision the Cell will ready the place for consideration and restructuring plan of the Empowered Group. It should be corporate borrowers. It should be multiple banking or syndication or consortium accounts (not a single lender account). Total Non-Fund based and Fund-based disclosure of Rs. 10 crore and above. There is no need of the account or company being ill. Ineligible for restructuring under CDR mechanism. It may be suitable with consent of the court provided. Under the CDR system the initiative to solve the case is adopted by at least 75% of the transaction (by value) and the lender is 60% (according to the number). Large value BIFR cases only, may be eligible of specifically recommended by the CDR Core Group. It covers ‘standard’ and ‘sub-standard’ accounts (min 90% pf creditors (by value) treated the account as standard or sub-standard. References can be made by one or more transactions, which are supported by a bank or financial institution having a working capital or term finance or a minimum 20% share, if the concerned corporate has at least 20% of the shares. Where the disclosure of the financial system is Rs. 100 crore, banks or Financial Institutions should review all eligible cases and decided about referring the case to CDR system or to proceed under the SARFAESI Act, 2002 or to file a suit in DRT etc. The Debtor-Creditor Agreement (DCA) and the Inter-Creditor Agreement (ICA) shall provide the legal basis to the CDR mechanism. Initially ICA is valid for a period of 3 years. ICA is legally obligatory agreement amongst the creditors. They assert that if 75% of creditors (by value) and 60% of the creditors (by number). They agree to an existing loan regeneration package (e.g., debt negative), and it will be compulsory for the remaining residual lenders. Where the accounts have been classified as ‘doubtful’ in the books of creditors this consists of cases. References can be made if by minimum 75% of the transaction (by value) and 60% of the lenders (according to the number) satisfy themselves for the convenience of the account and consent for such reconstruction. The existing loans will only be restructured under the category. Individually it would be up to the trailblazer to firm up additional financing arrangement with new or existing creditors.